A reliable source for Aqueous Cleaning Systems information and a resource for accessing leading Aqueous Cleaning Systems and suppliers. An aqueous cleaning system is a safe and effective alternative to solvent cleaning systems. They are used for cleaning parts. Aqueous cleaning systems use water based chemicals (which are less hazardous to operate) and heat and mechanical energy to clean parts. They are safer because they reduce the release of VOC (volatile organic compounds) which cause medical issues. Aqueous Cleaning Systems An aqueous cleaning system is a safe and effective alternative to solvent cleaning systems. They are used for cleaning parts. Aqueous cleaning systems use water based chemicals (which are less hazardous to operate) and heat and mechanical energy to clean parts. Aqueous cleaning systems work by breaking up dirt and grease using heat, pressurized water, soap and agitation. 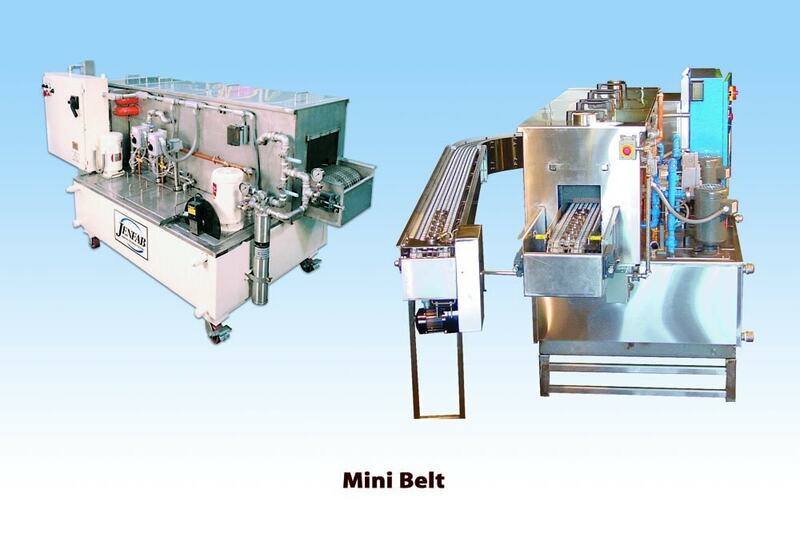 There are different kinds of aqueous cleaning systems. Spray cabinets clean by spraying heated solutions at high pressures in an enclosed cabinet. 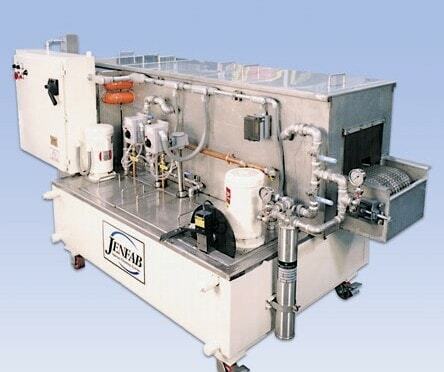 Aqueous Cleaning Systems - Jenfab/Jensen Fabricating Engineers, Inc.
Spray cabinets range and vary greatly in size. Ultrasonic units are equipped with transducers along the bottom or side of the tank and the transducer generate high frequency sound waves that allow for a microscopic scrubbing action on the surfaces of parts. Immersion units have a removable false bottom which allows parts to be submerged in the solution and loosen soils and reduce scrubbing time. Drum top units are the most similar to solvent units. They use microbes in the aqueous solution to degrade oils and organic contaminants. These microbes are safe and pose no threat to those who come in contact with them. All these aqueous cleaning systems have an aqueous solution in them that helps with the cleaning. Certain factors affect the cleaning results in an aqueous cleaning system. These include mechanical energy, temperature, detergent, and time. Changing or altering any of these factors affect s the cleaning outcome. Aqueous cleaning systems use alkaline based detergents mixed with water to clean. Most aqueous cleaning systems use an electric motor to drive a centrifugal pump which determines the power density of the machine. For two aqueous cleaning systems to have similar cleaning results, their power density must be the same.